Provided is a polyimide powder which does not contain metal impurities that are generated by abrasion of a machine during pulverization by the machine or the like and which has an average particle diameter of 25 μm or less. The polyimide powder is an assembly of fine particles that are obtained by precipitating a polyimide dissolved in a treatment solution that contains a basic substance. The residual amount of an alkali metal, which is the basic substance contained in the treatment solution, is 1% or less relative to the total amount of the powder. Consequently, adverse effect of the remaining alkali metal can be reduced, thereby hindering the progress of polyimide decomposition by the alkali metal. The present invention heat resistant material parts, automobile parts, mold molding of the threaded portion of the glass bottle, a method of manufacturing a polyimide powder and polyimide solution and the polyimide powder can be used in such adhesives. Conventionally, in order to effectively utilize recycled polyimide film in large quantities as industrial waste, etc., it has been made that the polyimide film was pulverized by mechanical obtain a powder. Further, to obtain a powder of the polyimide film was alkali hydrolyzed consisting microparticles of low molecular weight compounds is performed (e.g., see Patent Document 1). Such powder is used as a molding material by mixing with alone or other resins. However, in the method of pulverizing by the machine, the average particle size (D 50) obtained only a powder of more than 25 [mu] m, also had the metal impurities by mechanical wear are mixed into the powder. On the other hand, the method using alkaline hydrolysis of the above, there is decomposed almost most of the polyimide problem only powder consisting of fine particles of low molecular weight compounds is not obtained. The present invention has been made in view of the above, not containing metal impurities by mechanical wear such as mechanical grinding, the average particle size provides the following polyimide powder and its manufacturing method 25μm it is an object of the present invention. Further, the present invention aims to provide a polyimide solution containing the polyimide powder. Polyimide powder of the present invention is an aggregate of fine particles obtained by precipitating the polyimide dissolved in the treatment solution containing a basic substance, the residual amount of the alkali metal basic substances contained in the treatment liquid powder it is characterized in that 1% or less with respect to the body the total amount. In the polyimide powder of the present invention, it is preferable that the polyamic acid of said fine particles by heating is formed by polymerizing the polyimide. Polyimide solution of the present invention is the polyimide powder is characterized by comprising dispersed or dissolved in a solvent. In the polyimide solution of the present invention is contained in the polyamic acid derived from the fine particles of the polyimide powder, it is preferred that the polyamic acid can be polymerized into polyimide by heating. Method for producing a polyimide powder of the present invention, after dissolving the polyimide with a processing solution containing a basic substance, to obtain a powder by precipitating fine particles of the polyimide by mixing the treatment liquid and an acidic substance, by removing the alkali metal of the basic material from the powder, and is characterized in that the residual amount of the alkali metal of the powder total amount of 1% or less. In the production method of the polyimide powder of the present invention, it is preferable that the basic substance is potassium hydroxide. In the present invention, since the deposit after dissolving the polyimide in the treatment liquid, as compared to grinding with the machine, in which the average particle size of the polyimide to atomized or less can be obtained powder 25 [mu] m. Also, since not performed mechanical grinding, in which it is possible to prevent the contamination of metal impurities by mechanical wear. Furthermore, since the residual amount of the alkali metal with respect to the powder total amount is 1% or less, it is possible to reduce the adverse effect of alkali metal remaining, decomposition of the polyimide in the microparticles with alkali metal remaining is less likely to proceed , which compound in the microparticles is less likely to be lowered in molecular weight, moreover, is hardly impaired polymerization of the polyamic acid contained in the fine particles, in which the content of the polyimide can be obtained by utilizing the powder is there. (A) has the formula of an example of the compounds included in the polyimide of the raw material in the present invention, (b) has the formula of an example of a compound contained in the polyimide powder before heating, (c) after heating it is a chemical formula showing an example of a compound contained in the polyimide powder. (A) chart showing a DTA curve and Tg curves of the polyimide powder before heating in the present invention, (b) is a chart showing a DSC curve of the polyimide powder before heating of the same. (A) chart showing a DTA curve and Tg curves of the polyimide powder after heating in the present invention, (b) is a chart showing a DSC curve of the polyimide powder after heating of the same. Is a chart showing the results of infrared absorption analysis in Comparative Example 3. Is a chart showing the results of infrared absorption analysis in Comparative Example 1. Is a chart showing the results of infrared absorption analysis in Comparative Example 2. Is a chart showing the results of infrared absorption analysis in Example 1. Is a chart showing the results of infrared absorption analysis of the heating time 0 min Example 2. Is a chart showing the results of infrared absorption analysis of the heating time 30 min Example 2. Is a chart showing the results of infrared absorption analysis of the heating time of 60 minutes in Example 2. Is a chart showing a particle size distribution of Example 1. Is a chart showing a particle size distribution of Comparative Example 3. (A) (b) is a scanning electron micrograph of Example 2. Hereinafter will be described the embodiments of the present invention. Polyimide powder of the present invention is an aggregate of the dissolution processing solution to precipitate (hydrolysed) polyimide particles. Polyamic acid is contained in the fine particles of the polyimide powder. Polyimide powder has a particle size distribution of example 1 ~ 500 [mu] m, an average particle diameter (median diameter: D 50) can be set to 25μm or less. To obtain a powder of desired particle size distribution can be selected by using the sieve or the like. Since a machine grinding no large force is applied to the polyimide film and molded article of a raw material, it can not be an average particle diameter obtained the following polyimide powder 25 [mu] m, The metal impurities due to wear of the grinding machine in the polyimide powder also be incorporated. On the other hand, polyimide powder of the present invention because it is a chemical milling may be an average particle size 25μm or less. Further, the polyimide powder of the present invention also not occur mixing of metal impurities due to wear. The average particle size and particle size distribution described above may be measured particle size analyzer (e.g., Microtrac MT3300 manufactured by Nikkiso Co., Ltd.) by a laser diffraction scattering method using a. The polyimide powder of the present invention is obtained by a less than 1% by weight relative to the residual amount of the powder total amount of the alkali metal derived from the basic substance used in the treatment solution for dissolving the raw material of the polyimide . When the alkali metal is left more than 1% of the powder total amount of polyimide in the microparticles hydrolysis proceeds polyimide is low molecular weight, for example, pyromellitic dianhydride and 4,4 '- considered decomposed raw material of the polyimide, such as diaminodiphenyl ether proceeds. Therefore, the residual amount of the alkali metal derived from the basic substance used in the treatment solution by 1% or less by weight relative to the powder total amount, it is possible to reduce the adverse effect of alkali metal remaining, alkali of particles by the metal hydrolysis hardly proceeds, in which it is possible to further reduce the fine particles to be lowered in molecular weight after deposition. Therefore, by using as a molding material of polyimide powder of the invention in admixture with alone or other resins, it is possible to obtain a reinforcing effect of the polyimide, high heat resistance and high strength and high wear resistance of the molded in which it is possible to obtain the body. Since the residual amount of the alkali metal is as small as possible preferably, the lower limit of the residual amount of the alkali metal is 0%. Preparation of the polyimide powder of the present invention is performed as follows. First, dissolve the polyimide material with a processing solution containing a basic substance (hydrolysis) to. As the basic substance, it is possible to use at least one of an alkali metal or a salt thereof, for example, can be used strongly basic substance such as potassium hydroxide or sodium hydroxide. In particular, potassium hydroxide can be obtained polyimide powder discoloration is small from the raw material of the polyimide is preferred. In addition to water as the solvent of the treatment liquid, a mixed solution of an organic solvent of water and glycerin, or the like can be used. Processing liquid may be prepared by dissolving the basic substance in a solvent. Here, the basic substance 10-50 parts by weight per 100 parts by weight solvent, preferably can be dissolved 10-40 parts by weight, also, pH of the treatment liquid can be 10-14. Thus, it is possible to satisfactorily perform the dissolution of the raw material of the polyimide. Polyimide material dissolved in the treatment solution, as long as it contains an imide bond as a repeating unit in the main chain of the polymer, for example, and the like aromatic polyimide aromatic compound are linked with directly imide bond it can. Raw material of the polyimide, for example, industrial waste, such as cutting chips or defective products generated in the process of making the polyimide film, as long as it contains a polyimide waste of polyimide products, whatever good, little polyimide impurities preferably used films of cutting debris and defective. Raw material of the polyimide is dissolved by immersion in the processing solution. In this case, 40 to 120 parts by weight per 100 parts by weight solvent of the treatment liquid, preferably can be formulated polyimide in a ratio of 40-80 parts by weight and the temperature of the treatment liquid 70 ~ 100 ° C., preferably 70 ~ 90 ° C., the treatment time may be 50 to 100 minutes. In addition, if desired, may be subjected to stirring. Thus, it is possible to satisfactorily perform the dissolution of the raw material of the polyimide. Next, after the raw material of the polyimide was the treatment solution as needed (approximately 10 minutes) cooling dissolution, the treatment liquid was neutralized by addition of acidic substance to precipitate fine particles of the polyimide was dissolved . Examples of the acidic substance may be used a weak acid such as a strong acid or phosphoric acid, such as hydrochloric acid. The addition amount of the acidic substance 10 to 50 parts by weight per 100 parts by weight solvent of the treatment liquid, and preferably, to a ratio of 10 to 40 parts by weight, carried thereby, to ensure the deposition of polyimide microparticles be able to. Further, the addition of acidic substances, it is possible to the pH of the treatment liquid polyimide is dissolved in 4-6. Then separated powder processing solution after the neutralization polyimide fine particles are precipitated by filtration consists of the solids content of the polyimide of the microparticles. Filtration or the like can be used as a filter press. The filtration can be separated and a liquid portion containing an alkali metal derived from the solids and the basic substance of the polyimide particulate. Then, washing the powder of fine particles of the separated polyimide. This water washing, attached, etc. to the fine particles of polyimide remaining on the polyimide powder, an alkali metal derived from the basic substance can be removed (weight loss). Water washing, the solid was filtered as a step a step of stirring in water, it is possible to perform this process until the residual amount of the alkali metal is 1% or less (e.g. 5-10 times) repeated. More specifically, for example, water temperature 60 ° C. water at a ratio of 100 l with respect to the powder 50 parts by weight of the particles of the separated polyimide, as one step the step of stirring for 30 minutes, this six times can be carried out in to water washing is performed. Thereafter, dehydration under reduced pressure, followed by drying to about 12 hours at a temperature 70 ~ 80 ° C., can be obtained polyimide powder of 0.5% or less water content. The polyimide powder is one having an average particle diameter is 25μm or less. Further, the polyimide powder obtained as described above can be used as a molding material by mixing with alone or other resins. For example, a mixture of the polyimide powder of 10-30 wt% relative to the powder of tetrafluoroethylene resin having a particle size of 10 ~ 100 [mu] m, the mixture 300 ~ 360 ° C., hot pressing under the condition of from 10 to 50 MPa by, sheet or molded article (e.g., the sliding parts of the rotary bearing) can be produced and the like. Further, the polyimide powder 50 wt%, and 40 wt% thermosetting phenolic resin, and compounded by mixing the carbon black 10 wt%, which 190 ~ 250 ° C., of 10 ~ 20 MPa, 30 ~ 45 minutes by heat and pressure molded under the conditions, it is possible to produce heat resistant material parts, automobile parts, the molded article can be utilized such as the mold forming the threaded portion of the glass bottle. Further, by molding heat and pressure a mixture of the polyimide powder and carbon fiber (carbon fiber) and tetrafluoroethylene powder, it is possible to produce a molded article having a heat resistance and impact resistance. Further, by dissolving or dispersing the polyimide powder in the solvent, it is possible to obtain a polyimide solution. The polyimide solution may be used as an adhesive or a coating agent, in particular, the metal member is strongly bonded, can be used as a heat-resistant adhesive having high. Here, as the solvent for the polyimide solution can be an aprotic polar solvent such as N- methyl-2-pyrrolidone (NMP) or dimethylformamide. Further, a ratio of 1 to 400 parts by weight of the polyimide powder 100 parts by weight, preferably by blending a solvent in a proportion of 40-300 parts by weight, it is possible to prepare a polyimide solution of the present invention. Fine particles constituting the polyimide powder of the present invention, in addition to the polyimide are those containing a polyamic acid which is a precursor of polyimide, and other decomposition products. That is, the polyimide of the material before hydrolysis with the treatment liquid, for example, as shown in FIG. 1 (a), the powder is a polyimide having a repeating unit represented by the formula (A), and this in the above step with reduction, containing a polyimide having a repeating unit represented by the formula (a) in FIG. 1 (b), the polyamic acid having a repeating unit represented by the formula (B), a degradation product represented by the chemical formula such as of formula (C) It particles it is possible to obtain that. Further, fine particles constituting the polyimide powder of the present invention, by heating, it is possible to improve the content of the polyimide. This polyamic acid contained in the fine particles was polymerized into polyimide, the polyimide of the polyamic acid is considered to proceed. Thus, fine particles of polyimide powder after heating, as shown in FIG. 1 (c), is to improve the content of polyimide having a repeating unit represented by the formula (A). 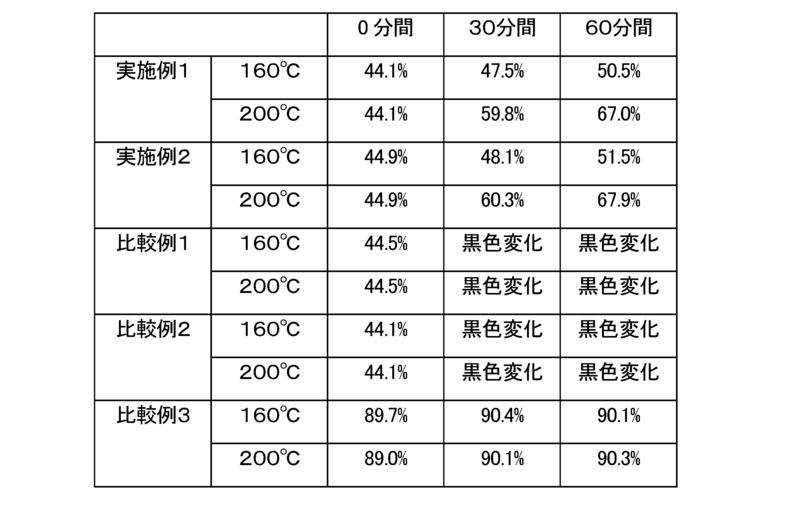 The polymerization of the polyamic acid is started from the vicinity of 160 ° C., also because it is less polymerization may become high polymerization degree or promoted, by heating the fine particles of the polyimide powder in 160 ~ 230 ° C. and above 230 ° C. to improve the content of the polyimide Te is preferred. The time when the heating is not particularly limited, but is preferably a temperature of above is held for 30 to 60 minutes, thereby, polymerization lack of the polyamic acid is less likely to occur, also extra (excess do) can be made to the heating is not performed. Heating of such fine particles can be carried out by heating the polyimide powder. In this case, it is possible to obtain a polyimide powder containing a large amount of fine particles in which the content of the polyimide is increased, the polyimide powder can be blended such as a resin material and cement material as aggregate. Further, after forming the molded article as described above by using polyimide powder before heating, by heating the shaped article, the polymerization of polyamic acid in the molded article derived from the fine particles of the polyimide powder can. In this case, it is possible to obtain a molded product in which the content of the polyimide is improved heat resistance increases. Furthermore, after preparing a polyimide solution as described above by using polyimide powder before heating, by heating the polyimide solution, the polymerization of polyamic acid in the polyimide solution to from fine particles of polyimide powder can. In this case, although such coating or bulk material with a compound of a polyimide solution with a solvent of the polyimide solution is evaporated is produced, the film or lumps have improved heat resistance by increasing the content of the polyimide it is intended. The present invention will be described examples specifically. The polyimide of raw materials, using a Du Pont-Toray Co., Ltd. of the polyimide film Kapton (registered trademark). As the basic substance with potassium hydroxide (KOH), by dissolving 40 parts by weight of potassium hydroxide relative to 100 parts by weight of water to prepare a treatment solution containing a basic substance. The pH of the treatment solution was 14. Then, by dissolving a mixture of 100 parts by weight polyimide material with respect to 100 parts by weight of water of the processing solution, to give a treatment liquid polyimide is dissolved by alkaline hydrolysis. The dissolution was carried out under conditions of 90 minutes at a temperature of 80 ° C..
Then, by adding an acidic substance to the treatment liquid polyimide was dissolved to precipitate fine particles of the polyimide was dissolved with neutralizing the treatment liquid in the treatment liquid. Here, as the acidic material with hydrochloric acid (HCl), and the hydrochloric acid of 38% strength with respect to 100 parts by weight of water of the treatment solution was added 40 parts by weight. Furthermore, the neutralization process was stirred until complete neutralization of the processing solution. Next, to separate the solids by filtration the treatment liquid polyimide fine particles are precipitated. It was then washed with water The solid separated. Water washing, a step of the solid was filtered and stirred for 20 minutes at room temperature in water as a step, this step was repeated 6 times. Then, the solid was washed with water and dehydrated by vacuum, followed by drying for 12 hours at a temperature 70 ~ 80 ° C., to obtain a polyimide powder of 0.5% or less water content. As the basic substance with potassium hydroxide (KOH), by dissolving 20 parts by weight of potassium hydroxide in water 50 parts by weight, to prepare a treatment solution containing a basic substance. The pH of the treatment solution was 14. Then, by dissolving a mixture of polyimide 50 parts by weight of the material with respect to 50 parts by weight of water of the processing solution, to give a treatment liquid polyimide is dissolved by alkaline hydrolysis. The dissolution temperature was carried out for 90 minutes at 95 ° C.. This was the treatment solution was cooled for 10 minutes. Then, by adding an acidic substance to the treatment liquid polyimide was dissolved to precipitate fine particles of the polyimide was dissolved with neutralizing the treatment liquid in the treatment liquid. Here, as the acidic material with hydrochloric acid (HCl), it was added at a ratio of 35 parts by weight hydrochloric acid and water 35 parts by weight per 50 parts by weight of water of the processing liquid. The hydrochloric acid and water were charged into the treatment solution over 20 minutes. Furthermore, the neutralization process was stirred until complete neutralization of the processing solution. Next, a treatment liquid polyimide fine particles are precipitated by filtration squeezed for 30 minutes on a filter press to separate the solids. It was then washed with water The solid separated. Water washing, a step of stirring for 30 minutes at kettle temperature 60 ° C. Put 100 liters of water relative to the filtered solids 50kg as one step, and this step was repeated 6 times. Next, by drying for 48 hours the solid was washed with water under reduced pressure (near vacuum), to obtain a polyimide powder of 0.5% or less water content. The polyimide powder of Example 1 to obtain a polyimide solution by dissolving in a solvent. The solvent was used NMP. Also, the solvent was added in an amount of 300 parts by weight of the polyimide powder 100 parts by weight, to obtain a solid concentration of 25% polyimide solution. In Example 3, the polyimide solution was prepared using the polyimide powder of Example 2 in place of the polyimide powder of Example 1. Others were the same as in Example 3. In Example 1, it was washed with water three times steps. Except for this to obtain a polyimide powder in the same manner as in Examples. In Example 1, it was not washed with water. Except for this to obtain a polyimide powder in the same manner as in Examples. The polyimide film used in Example 1 was ground by mechanical grinding. The pulverizer was a vibration mill manufactured by Central processing machine. In Example 3, to prepare a polyimide solution with a polyimide powder of Comparative Example 1 in place of the polyimide powder of Example 1. Others were the same as in Example 3. In Example 3, to prepare a polyimide solution with a polyimide powder of Comparative Example 2 in place of the polyimide powder of Example 1. Others were the same as in Example 3. It was heated polyimide powder 10 parts by weight obtained in Examples 1 and 2 and Comparative Examples 1 and 2. The heating temperature is 160 ° C., 200 ° C., and then, 0 minutes heating time at each heating temperature, 30 minutes, was 60 minutes. Then, to measure the imidization ratio of the polyimide powder after heating at each temperature and each time. Measurement of imidization rate performs the infrared absorption analysis (IR) measured using a FT / IR-670Plus manufactured by JASCO Corporation, was analyzed the chart. Then, (absorbance of IR benzene ring (1500 cm -1)) (IR imido group (absorbance 1375cm -1)) /? It was calculated imidization rate 100 expression. The results are shown in Table 1. As is evident from Table 1, in Examples 1 and 2, the longer the heating time tends to imidization ratio is improved accordingly. This polymerization of the polyamic acid contained in the polyimide powder is a polyimide is produced proceeds by heating, it is considered the content of the polyimide is increased. On the other hand, in Comparative Examples 1 and 2, since the impurity is not sufficiently removed, imidation becomes insufficient, turned black. Incidentally, in order to be Comparative Example 3 In mechanical grinding, the imidization ratio before heating is high, did not polymerization proceeds by heating. For polyimide powder of Example 2, DTA of before and after heating (60 min at 200 ℃), Tg, was measured DSC. Measuring instrument, using a "DSC8230" manufactured by Rigaku Corporation. The measurement is carried out under a nitrogen atmosphere (flow rate 20 ml / min), heating rate was performed at 10.0 ° C. / min. The DTA curve and Tg curves of the polyimide powder before heating in Fig. 2 (a), respectively a DSC curve of the polyimide powder before heating in Figure 2 (b). Further, the DTA curve and Tg curves of the polyimide powder after heating in FIG. 3 (a), respectively a DSC curve of the polyimide powder after heating in Figure 3 (b). Infrared absorption analysis of Example 1 and Comparative Examples 1 ~ 3 (IR) was measured. As the measuring apparatus, using FT / IR-670Plus manufactured by JASCO Corporation. The chart of each IR spectra shown in Figures 4-7. As a result, shows the peaks 3 and 5 from the polyimide in Example 1, similar peak 4, 5 Comparative Example 3 was mechanically pulverized are seen. Therefore, it can be said to be a powder consisting of fine particles containing a polyimide in Example 1. On the other hand, a peak derived from polyimide in Comparative Examples 1 and 2 is unclear, microparticles containing many components other than polyimide (e.g., polyimide particles of a compound of hydrolyzed low molecular weight) is considered to have been precipitated. Further, the infrared absorption analysis measurements, for Example 1 and Comparative Examples 1 and 2 were measured residual amounts of potassium. As a result, the residual amount of potassium of Example 1 was 1% of the total weight of the powder. Residual amounts of potassium Comparative Example 1 was 3% of the total weight of the powder. Residual amounts of potassium Comparative Example 2 was 10% of the total weight of the powder. Also, heating the polyimide powder 10 parts by weight of the Example 2 at 200 ° C.. The heating time is 0 minutes, 30 minutes, was 60 minutes. For polyimide powder after heating at each time, it was subjected to the same infrared absorption analysis (IR) measurement as above. Results of one heated for 0 min (chart) in Figure 8, Figure 9 the results of the one heated for 30 min, indicates the results of one heated for 60 min in Figure 10. In comparison of these results, compared to the chart of the heating time 0 minutes, the chart of the heating time of 30 minutes or between 60 minutes and 1375 cm -1 and around 1500cm absorbance around -1 is reduced. Thus, by heating, it is considered to imidation of the polyimide powder has progressed. The Nikkiso laser diffraction scattering method using a Microtrac MT3300 Co., Ltd., the results of measuring the average particle size and particle size distribution of Comparative Example 3 and Example 1, in the embodiment the particle size distribution as shown in FIG. 11 the average particle diameter of 1.06 ~ 7.78μm is (D 50) was 2.67Myuemu, average particle diameter size distribution 3.00 ~ 249.0μm as shown in FIG. 12 in Comparative example 3 (D 50) was 32.16μm. Thus example with an average particle diameter in comparison with Comparative Example 3, 1 is small can be obtained narrow polyimide powder particle size distribution. Further, in FIGS. 13 (a) and (b), shows a photograph by scanning electron microscope of the polyimide powder of Example 2. Particles of polyimide powder from this photograph it can be seen that less than 10 [mu] m.
The polyimide solution prepared in Example 3 and 4 and Comparative Examples 4 and 5 were used as an adhesive. The test method was used JIS K6849 (tensile adhesive strength test method of adhesive) or the like. As a result, it was possible firmly bonded to imidization progresses by heating in Examples 3 and 4, in order to imidization In Comparative Examples 4 and 5 are hardly proceeds, adhesive strength than Examples 3 and 4 is lower It was. An aggregate of fine particles obtained by precipitating the polyimide dissolved in the treatment solution containing a basic substance, the residual amount of the alkali metal basic substances contained in the treatment liquid 1% or less with respect to the powder total amount polyimide powder, characterized in that it. Polyimide powder of claim 1, polyamic acid of said fine particles by heating, characterized in that formed by polymerizing the polyimide. Polyimide solution polyimide powder according to claim 1 or 2, characterized by comprising dispersed or dissolved in a solvent. After dissolving the polyimide with a processing solution containing a basic substance to precipitate fine particles of the polyimide by mixing the treatment liquid and the acidic substance to obtain a powder, alkali metal from the powder of said basic substance by removing the method for producing a polyimide powder, which comprises the remaining amount of the alkali metal of the powder total amount of 1% or less. Producing a polyimide powder according to claim 4, wherein the basic substance is characterized in that it is a potassium hydroxide.